Adopting Advanced Inverter Technique and Excellent Capacity Equipment. Protective equipments are installed internally, to prevent overheating, Excess Currents, Voltage Fluctuations to ensure Safe Operation. Soft, magnetic, ferrite materials are used in high frequency transformers, Resulting in high Conversion rate, high efficiency and energy saving. Simple structure, excellent technique, durability, reliability and easy maintenance. 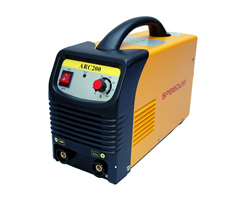 Ideal equipment to weld Stainless Steel, Carbon Steel, Pure Copper etc. Usable Electrodes: Acidic, Alkaline, Cellulose. Adopting passive power factor correction. Negligible welding flash, with a High Deposit Rate. An Extremely Efficient & Energy Saving Equipment.